This Amex-branded card from Bank of America pays 1.25% cash rebate on spending, plus an additional $50 bonus statement credit just for using it a few times. This great card deal is for people with good credit who want a rich cash-back rewards card and for those who prefer the American Express brand over other options like Visa and MasterCard. With only two obvious disadvantages to this card, including high redemption thresholds (minimum $50) and a high balance transfer fee of 4%, the pros listen below outweigh the cons. The 1.25% cash-back spending rebate on this card is one of the richest in the industry. In addition, you can earn an additional $50 in statement credits by spending $500 on retail purchases within the first 90 days. The $50 redemption threshold is a lot higher than other credit cards, and some have no minimum redemption amounts, but the higher rebate percentage makes up some of the difference. This card also lacks the 5% cash back on quarterly rotating categories. In exchange, you get an extra .25% on all your purchases and you don't have to change how you spend to get it. Points can be redeemed at 2,500 points and expire five years after the month they were earned. 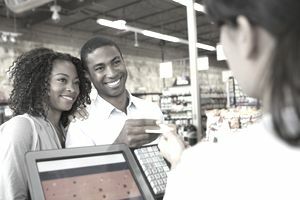 One easy way to earn rewards is to use the credit card for everyday purchases, like groceries, gas, and utility bills. Cardholders can also earn points for purchases and redeem rewards with travel, gift cards, cash back, and special events. For example, in the travel category alone, rewards can be accumulated for airfare, car rentals, hotels, and resorts, and special experiences on your trip like show tickets and excursions. The program has rules for each category that outline the benefits. For instance, FlexAir rewards are available to any cardmember and Premium Air rewards are eligible for Gold, Accelerated Rewards, and Platinum ​American Express Cardmembers. $50 in bonus cash rewards are easily obtainable. 1.25% cash-back rebate on spending. $50 statement credit if you spend $500 on retail purchases on the card within the first 90 days. 0% for 12 months on purchases and balance transfers made within the first 60 days of account opening. 12.99% to 22.99% after the introductory period. Cash advance APR: 22.99% or 24.99% depending on the type of cash transaction. Penalty APR: Up to 29.99%. Balance transfer fee: $10 or 4%. Cash advance fee: $10 or 4% (5% depending on the transaction). Returned payment fee: Up to $25.